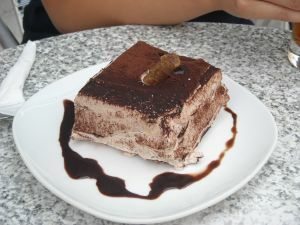 Tiramisu, commonly known as the ‘coffee cake’, is a delicious, savoury and decadent coffee treat. Tiramisu is an Italian cake and is best known for its Mascarpone custard layer, ladyfinger cookies and coffee. It can be served with the evening tea/coffee or can be taken on its own. Take a sauce pan and beat the egg yolks after adding sugar to it. Continue the process until it gets well blended. Add milk to the mixture and whisk again before putting the sauce pan over medium heat. Keep on stirring the mixture until it starts boiling. Boil the mixture gently for one minute prior to removing it from the heat and then allow it to cool to some extent. Put the mixture in the refrigerator for one hour to get it chilled. Take vanilla and cream and put them in a bowl. Whisk them gently until the stiff peaks form. Beat mascarpone with the yolk mixture until it gets smooth. Take a small bowl and mix rum and coffee. After the mixture is prepared, soak the ladyfinger cookies in it, after cutting them in half length. Divide the soaked ladyfinger cookies in two different parts and arrange one half on the 7x11 inch dish. Take half of the mascarpone mixture and pour it over ladyfinger cookies’ layer. Do the same with whipped cream and put it over the mascarpone mixture. Cover the cake and put it into the refrigerator for around 4 to 6 hours. A delicious and mouth-watering cake is ready to serve.